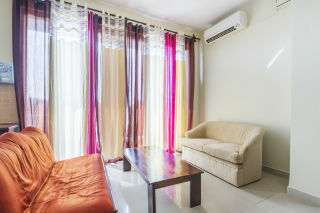 Situated 1.7 km from Vagator Beach, this offering of a private room can accommodate up to three guests. This accommodation is perfect for a laidback holiday. The apartment boasts a swimming pool. It is 2 km from Ozran Beach, 1.8 km from Chopra Fort, and 2 km from Thalassa. Your Space The apartment is located in a well-developed locality. 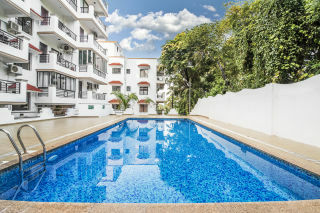 The holiday home boasts a shared swimming pool, perfect for a refreshing dip. The apartment boasts a spacious living room. It is appointed with a couple of plush couches and a minimalistic table. 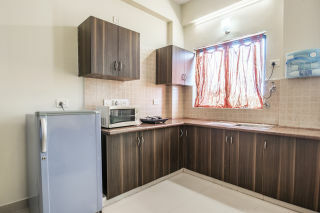 The kitchenette is equipped with an electric stove, a microwave, and a refrigerator to facilitate basic cooking. 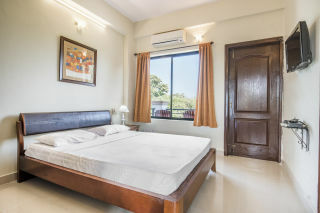 The bedroom is furnished with a chic double bed, a bedside table with a classic lamp, a generous wardrobe, a mirrored dresser for dressing convenience, and a flat-screen television so you can watch your favourite shows while on vacation. 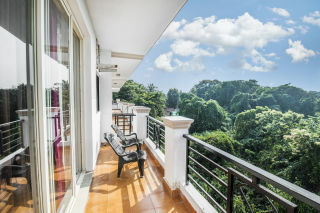 The balcony captures a refreshing view of the surrounding greenery and the perfect place to relish a cup of coffee. The attached bathroom is appointed with a glass shower enclosure and modern sanitary ware. Guests are required to provide valid identification at the time of checking in. 1) The guests are requested to provide valid identification at the time of check-in. 2) Pets are not allowed. 3) Please shower before entering the swimming pool. 4) Swimming Costume Mandatory. 5) Pool timings are for 6am-6pm. 6) No food and drinks in the pool area. 7) No glassware or bottles near the pool area. 8) No smoking in the pool or deck area. 9) No diving in the pool. 10) Children under the age of 12 years MUST be accompanied by a person over the age of 18 years. 11) NO LIFE GUARD ON DUTY, SWIM AT YOUR OWN RISK. This was my second trip to Goa this year and after my first experience i wanted to stay here only. 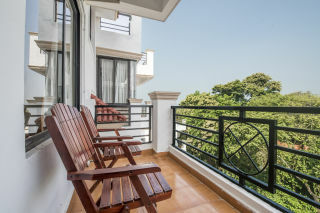 The best apartments with a classic view of Chapora fort and Beach from one balcony and the view of swimming pool from the other. 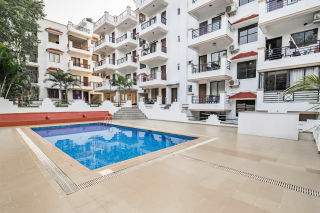 Spacious, well maintained, couple-friendly and clean. I will definitely recommend to all my friends.